I love Lang Lang, the young wunder-pianist from China. I go to hear him in person whenever possible, and I've bought several of his CDs. I think he is incredibly talented. He plays standards of the repertoire that I've heard many times, and he makes them new in his own way. I especially love the way he plays Beethoven's Piano Concerto #4, the second movement, based on the Orpheus and Euridyce story. I think he interprets it in a very Chinese way, and one of my Chinese friends agrees. Here, he plays and talks about it. He is especially well liked by people like me who love to hear him talk. He has such a mesmerizing effect on his audiences. He sounds so humble and so personal at the same time, in a way similar to Yo Yo Ma. I've heard him give Q and A sessions after concerts, and he appears quite open and honest with the audience. His life story is an interesting one. He was brought up in poverty by parents who strongly wanted him to succeed and gave up the little creature comforts they had to pay for him to live and study in Beijing when he was only a small child. Lang Lang has told his story repeatedly and lovingly in ads for his music when he worked for Deutsche Grammophone and in two "as told by" books. His CDs and DVDs sell like hotcakes. He endeared himself to a worldwide audience when he played at the Beijing Olympics in 1908. Lang Lang recorded for a long time on the DG label. DG has a history of hiring the very best artists, making the very best recordings of them, and educating people about them on their website. Here Lang Lang talks about the Tchaikovsky Piano Trio on the album "Tchaikovsky / Rachmaninof Piano Trios," another of my favorite recordings by Lang Lang. Recently, in a move that shook up the classical music community, Sony "bought" Lang Lang from DG for a mere $3 million (3,000,000 USD). Lang Lang has caught on to the entrepreneurial spirit in a big way, as noted by the magazine Success. He is promoting three products on his website , which I am presenting in order from the sublime to the ridiculous. First is a series of Lang Lang Youth Pianos made by Steinway. Lang Lang said that as a child, he dreamed of playing the Steinway, and he wants other children to have the chance to do so. The Lang Lang series pianos bear the star's signature in Chinese and English (simplified to LL) and gold stars on the vertical piano cover and sometimes inside the piano. 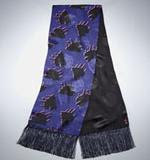 Next, as described in his website, is a silk scarf in "regal blue and black with a vibrant illustration of a classical piano in fuchsia" priced at a mere $150. The third item blew me away. I thought. "At least Lang Lang is endorsing goods related to the arts, not athletic shoes, a la Michael Jordan." Enter the Adidas Originals for Lang Lang, a limited edition pair of shoes worn by Lang Lang himself, but presumably not at performances in the concert hall. As quoted on the Adidas website, Lang Lang says "As an international pianist I combine both artistry and enthusiasm for sports – especially football...Therefore the linking of sports and culture is a very natural combination.” These black shoes bear Lang Lang's Chinese signature in gold on the heel, a golden silhouette of a pianist playing a concert piano on the side, and golden piano pedals printed on the sock liners. Here he is, just looking cute in his Adidas shoes. Lang Lang sounds just as humble and sincere in his commercials as he does in his talks about music. I don't know what to make of his brash money making, but I still believe that he is an incredibly good musician.